April « 2012 « Welcome to Property Source Nation! As Alex reported 4/28/2012 on Property Source Radio. As the number of for-sale homes listed on the multiple listing service (MLS) drops, the number of single-family homes up for rent has been gradually increasing, RISMedia reports. Single-family home rentals are a growing business, as more investors buy up foreclosures at bargain prices and then transform them into rentals. About 16 percent of all listings on the MLS are rentals, which is more than double the number of rentals listed in 2006, RISMedia reports. Single-family rentals are often listed on the MLS by real estate brokers, whereas multifamily units typically aren’t. The single-family rental market now accounts for “21 million rental units or 52 percent of the entire residential rental market,” according to a new study by CoreLogic. Single-family rentals are usually very differently from multi-family homes. For example, rents for single-family rentals typically are 1.5 to 1.6 times higher than multifamily homes. Also, families and prior home owners tend to be attracted to single-family rentals whereas multifamily tenants tend to be younger, more mobile people who have never owned a home before. Many of the single-family rental tenants nowadays are former home owners who had faced foreclosure and can no longer afford to own. According to CoreLogic, more than 3 million home owners have been turned into renters over the past five years due to foreclosure. 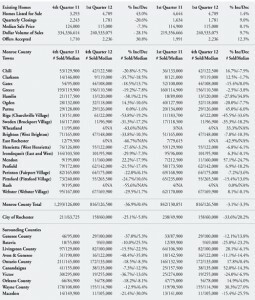 First Quarter statistics released by the Genesee Region Real Estate Information Services (GENRIS), the information subsidiary of the Greater Rochester Association of REALTORS® (GRAR), reflect an uptick in activity for the local housing market in the 11-county region, most likely attributed to the unseasonably warm weather. 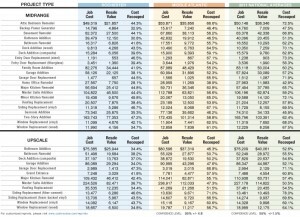 Transactions for the First Quarter 2012 showed a 9 percent increase over First Quarter 2011, with 1,781 homes sold, as compared to 1,634 during the same period last year. The number of homes listed rose significantly over the previous quarter, up 43 percent. The Median sale price held steady at $115,000. There were several towns within the region that experienced sales gains this past quarter from the same time a year ago. Most notably, Parma (Hilton Village) realized a 45 percent jump and Chili posted a 16.7 percent boost. Outlying counties also followed the trend. 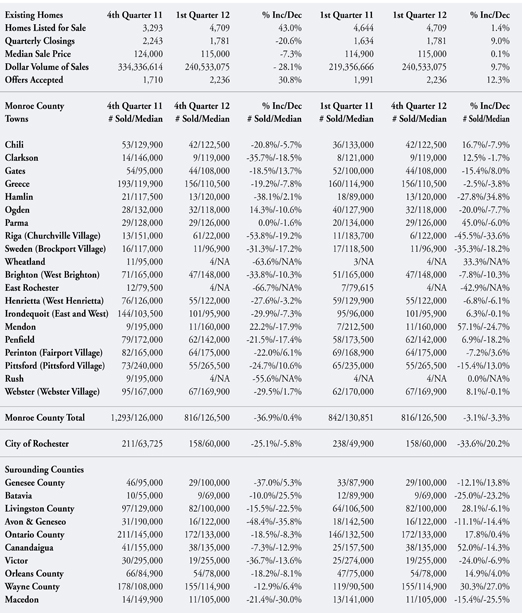 Wayne County recognized a healthy upturn in sales with a 30.3 percent year-over-year increase in number of existing homes sold and also realized a 27 percent jump in median price to $114,900. Dear JMan, I just purchased my home and am really excited about making some improvements and making it home. Do you have any suggestions as to what improvements will give me the best return on investment? First off, Congratulations on the purchase of your new home. It is a really exciting time when you buy a house and make it a home. I can say that a safe bet with any home is anything that enhances the curb appeal of the home and of course kitchen and bathrooms. You shouldn’t only consider improving what gives you the most “bang for your buck” as people like to say but also consider what may improve the quality of your life. For example, Let’s say you decide to put in an in ground pool and your family absolutely loves it and swims in it every day. You may only recoup around 30% of what you put in to it but the enjoyment your family received from having it is priceless or cannot really be measured in dollars and cents. The pool in that example has improved the quality of your family’s life. You may also want to consider how long you are going to be there. If you plan to move in 5-7 years then it may not make sense to upgrade to the Triple Pane vinyl window instead of double pane or upgrade to the 50 year shingle on the roof instead of the 30 year Architectural. 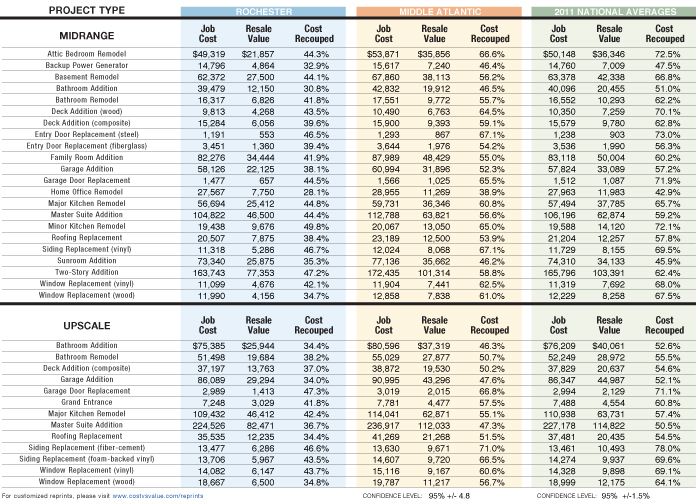 I am including a Cost Vs. Value Report that is put out every year by Remodeling magazine. It is always broken up by region but this year they even have it narrowed down to individual cities and Rochester,NY was included. I am only including an excerpt from the report for Midrange improvements. The job cost may seem high but you can visit www.costvsvalue.com to see the entire scope of each project. I would mainly go by the % of return to figure out what you can possibly recoup when you decide to sell. I would say to call a Realtor® who is familiar with your area and ask their advice. They will have their hand on the pulse of the market right now and tell you what appeals to today’s discerning buyers. Good luck on your future projects. If you are thinking of a home improvement in the near future and are wondering if it would be worth the investment the following is a guide of the top ten best returns for your money. Just remember that no matter what the return may be you shouldn’t overprice your home for the neighborhood you live in unless you either never intend to sell or won’t sell for a long time. You can invest any amount if it’s for your enjoyment and pleasure. One important tip is if you do intend to sell curb appeal items such as painting, siding, roofing, windows, new front door and landscaping are the best investment and then kitchen, baths and new furnace wit air conditioning! Garages are not listed below but if you don’t have an existing one adding one will return almost 90% of your investment. Patio rooms are also a good investment! Prior to the 1940s the majority of residential supply piping was galvanized steel. This is a very durable pipe that can last for generations. In the late 1930s, and especially post-World War II, copper supply piping became the industry standard. In the 1970s there was increased use of various types of plastic piping. However, copper piping has continued to be the material of choice for most traditional plumbing contractors to this day. 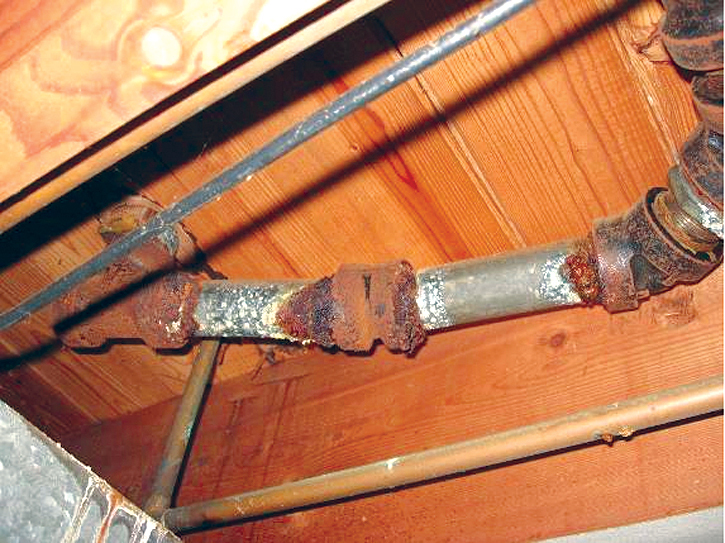 Although galvanized pipe is very durable, it eventually begins to rust, and ultimately leak. The other downfall to galvanized pipe is the eventual build-up of sediment or corrosion inside the pipe. This results in a “hardening of the arteries” affect, eventually adversely affecting water flow and water pressure. 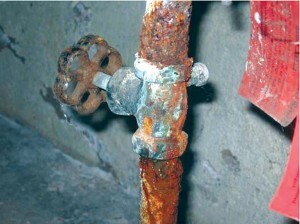 For this reason replacement of galvanized piping with copper usually results in an increase in pressure. 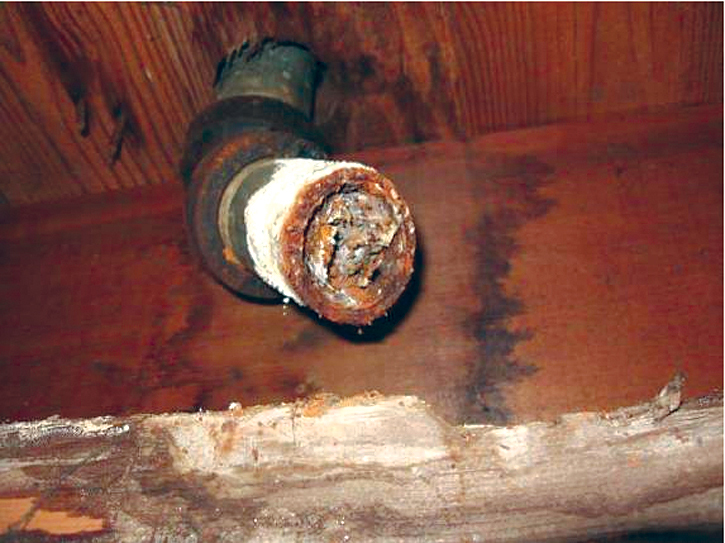 Copper pipe with soldered fittings does not rust or deteriorate in the same manner as galvanized pipe. Also, it is not prone to restricted flow from eventual build-up in the pipe. These qualities have made copper supply piping desirable for generations. Plastic supply piping has become popular greatly because the cost of copper pipe has increased. The most common type of plastic pipe in earlier years was CPVC (chlorinated poly vinyl chloride). The joints of this piping are glued together. It provides for a less costly alternative to copper, but it is less durable or reliable. The most modern type of “plastic” pipe is PEX (cross-linked polyethelyne). 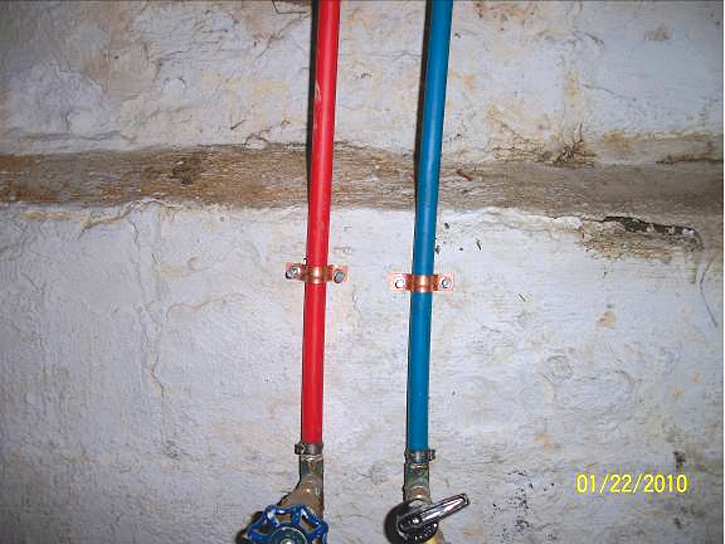 This is the color coded blue and red pipe that has prompted many of your inquiries as of late. The early returns on this type of piping have been very positive. Plumbing contractors in general have praised the cost benefits, ease of use and dependability of this pipe. 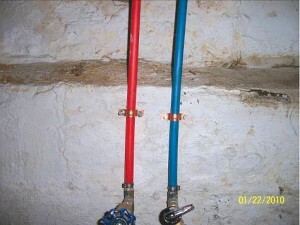 PEX piping can be used in two ways. Sections of the pipe can be joined or connected in a similar design to that of galvanized or copper pipes with elbows, “T”s, etc. The joints are rigidly clamped together (galvanized pipes have threaded fittings while copper pipes have soldered fittings). 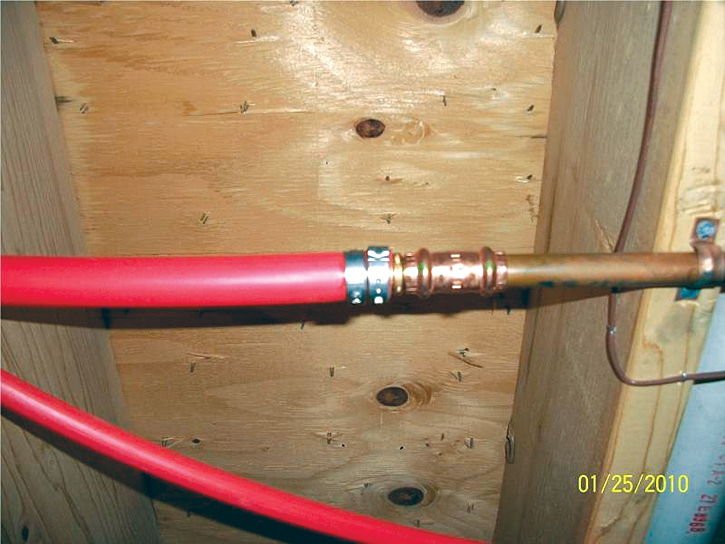 PEX piping can also be used in a “manifold” design. The manifold is located in the basement, near the main water service. This manifold feeds individual hot and cold pipes that seperately run from the manifold to each fixture in the house. This type of system greatly minimizes the number of joints or connections in the plumbing system. There is a single pipe feeding each fixture directly from the manifold to the individual fixture. 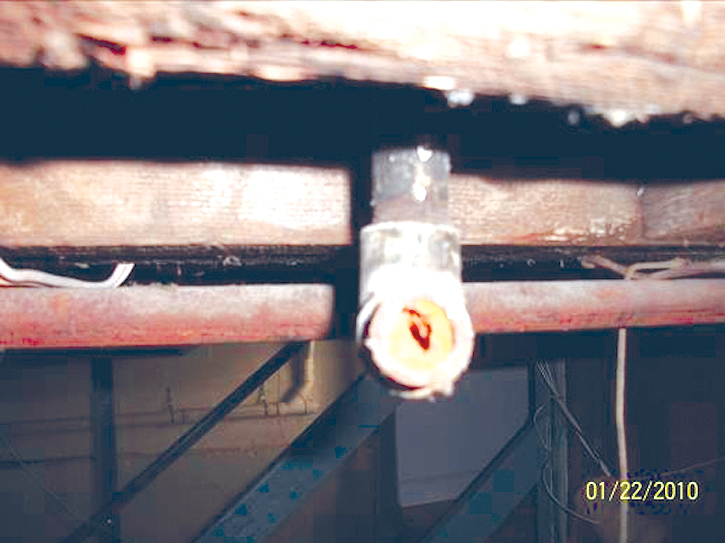 Since plumbing problems often times occur at the joints or connections, a manifold system can theoretically reduce the number of problems that might be experienced as time passes. Also, the joints of PEX piping restrict flow and reduce the pressure. Manifold systems result in more uniform pressures to the various plumbing fixtures in the house. Although manifold systems are not the norm, we have inspected a number of modern homes with this type of system. Similar to supply piping, waste piping has also evolved over the years. Steel or cast pipes were used for decades in the early to mid-1900s. Much like its supply counterpart this type of piping was durable and reliable, but was also prone to eventual rusting and leaking. These pipes can become restricted or plugged. Cast iron waste piping was primarily used on the larger piping (3” and greater) and is less prone to corrosion, as compared to galvanized piping. This waste piping is still used commercially; especially underground. Copper waste pipe was used in the late 1950s to the early 1960s. This piping is very dependable, but it is cost prohibitive and somewhat labor-intensive when soldering large joints. In the early 1970s “plastic” or PVC drain pipe became the norm for residential use. This remains the case to this day. PVC drains are durable, reliable and do not tend to be prone to unusual restrictions or blockages. 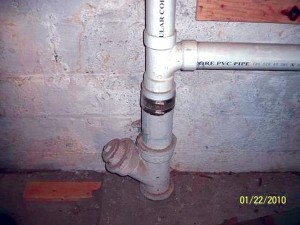 Most PVC drain piping is glued at its fittings. 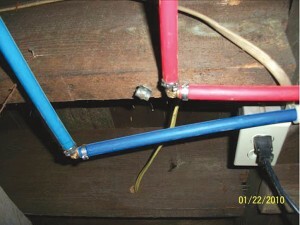 These connections are very dependable and are not prone to leakage. Threaded couplers are also used on plastic or PVC drain pipes for traps and drain connections. As a result, traps and drain extensions are very easy to clean and replace on an as needed basis. We hope that you find this information to be beneficial, and that it helps answer some of the questions that you may have on this topic. As is always the case, please do not hesitate to contact our office if we can be of any assistance. Self Discipline is not necessary. What!!! That’s ridiculous. Every success book and successful person is lauded for profound self discipline. In Jim Collins famous book, “Good to Great” one of his basic concepts to become a great company is a “Culture of Discipline.” But when you read the Collins book you find that he distinguishes between discipline through sheer force and discipline through focus and commitment. Self discipline is not necessary when you have sincere self motivation. What’s the difference? Imagine a sales person who knows that they need to make a certain number of calls each day. They set the time and place to make the calls. They get the list of names and practice scripts. Then they force themselves to show up and call. Most people don’t get started doing this. Most of ones who start, quit quickly. Most of the ones that keep it up don’t keep it up for long. The few who keep it up for a while seldom stick with it. Contrast that with the salesperson that has compelling goals; for their loved ones, for charity, for personal wealth, possessions, and/or travel. Contrast that with the salesperson who has always been a winner; the salesperson that grew up so poor that they remember seeing their father crying because he could not provide for his family. All of these salespeople are motivated internally. They will develop habits and practices that will lead to high levels of success that arise out of focus and commitment. One leads to breakdown; the other to empowerment. Self discipline is external, a threat or promise that one forces on themselves. It creates fatigue. It wears off as soon as the threat or promise weakens. For most who stick with it, keeping up the threat or promise over the long term eventually leads to breakdown. Self motivation is internal, a desire that one holds dearly. It creates excitement and energy. It sticks with you in a comfortable, enjoyable and very natural way. As one accomplishes results they feel empowered to make permanent changes that sustain success. It does take one, two, and three. How do you create this kind of self motivation? Can you create it? Or does self motivation have to come naturally? You can create it. First you need to have clear, measurable, and time bounded goals. Second you need to get clear on why those goals are important to you at an emotional level. For example, a Real Estate Agent sets a goal to earn $100,000 per year and does a good job breaking that down to monthly goals and a weekly focus. He or she then asks themselves why that is important to them. The first answer is, “to pay bills.” But that answer does not rouse an emotion. It is true and can lead to the emotional reason when he or she answers the following question. The second year that you earn that $100,000 and the bills are paid, then, what will that income do for you? The answer is, “I’ll finally put some money into savings and a retirement account.” This is also true and still not emotional. One more time, the third year, once there is money in those accounts and you are confident it will continue, what will that do for you? The answer, “Wow I’ll feel free.” As the person continues there is a deep sigh. Tension that the person didn’t even know was in their body begins to be released. Words begin to flow quickly. “I’ll replace the floor on my kitchen that has holes in it. I’ll buy a new car and stop worrying that the price of gas means I can’t go to the movies. I’d be able to go visit my granddaughter out of town whenever I want.” And the tears begin to flow as the combination of relief and anticipation are realized and felt. That is the first two steps to self motivation, clear, measurable, time bounded goals and a compelling reason to achieve them. The third step is ongoing. It can be done with pieces of paper, pictures on the wall, a screensaver, or any other reminder of that emotional reason. The third step is to constantly and continuously associate that compelling reason with the goals. This process, like many of the best things in life, is simple but not easy. It is not complicated but it may take weeks, and months, for some years to get clear on the reasons. It helps to have help. Over the past twenty years I have been extraordinarily fortunate to have coached many people to levels of success beyond what they ever thought was possible. I am always left with the feeling that I really didn’t do anything. They did it themselves. Because once a person is in touch and continuously aware of their most compelling reasons to succeed; then the skills and tools; the habits and systems that they learn from me are easy for them to implement. They are quick to stick with what works, abandon what does not work, focus on Clients that are worth their time and rigorously stop working or not begin to work with time wasters. What do you want; whatever is your business, profession, career, pursuit, passion, or job? Why is it important to you? How do you measure the success of it? Who is there to help you select the best methods, habits, and systems? The career you imagine and the life you imagine may be closer than you think. Rich Levin is a coach and teacher whose Clients often achieve extraordinary success. You can experience Rich’s work for free on his 15 minute coaching webinars weekday mornings by going to www.FreeCoachingWebinars.com and click on “Free Registration”, or listen to the recording each weekday by clicking on “Play Today’s Webinar”. If you would like to discuss coaching with Rich, contact him at 585-244-2700 or Rich@RichLevin.com. Dear JMan, I have been looking online and in the paper and have been noticing these funny bar code looking things. What are they for? I have a smart phone and tried to take a picture of it but nothing happened. Please help. The “Bar code” you speak of is whats known as a QR code.What is a QR Code? QR Codes or Quick Response Codes are essentially a “Barcode” imbedded with the information that you’d like others to view (phone number, video, website,or even a virtual business card). They are increasing in popularity in our area for marketing before the average consumer knows what to do with them. In larger metro areas you see them everywhere and even in the far east, like Japan, there is hardly a commercial on TV or advertisement anywhere without one. In real estate, these codes are mainly used to drive you to a website, virtual tour or video of a property. It makes sense if you see it in an ad or on a sign to scan it so that you can see where it takes you. You may be able to do a virtual walk through of the property right from the car or the side walk. It really wouldn’t make sense to scan the QR code if you are already on the website because it will more then likely bring you back to the same spot that you already were. If you see something that says to scan for more pictures or for a video tour then I would say go for it!! You can’t just take a picture of it with your phone.You will need to download a QR code reader to your phone, iPad or tablet. 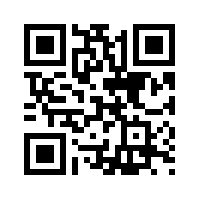 You still have to go to your App store or Android Market and search for a QR code reader and then download it. You only have to do this once not every time you want to scan a code. You can then use the app to scan the QR codes and go where you have never gone before (excuse the Star Trek reference). It is my opinion as agents become more advanced and creative with the marketing and implementing of these QR codes, that there is no limit to where these will take you. You will be able to walk through a beach front property in the Carribean from a cold winter here in Rochester, NY. It certainly will save you lots of time and in some instances, money. Here is a QR code for you to scan. Let’s see where it takes you! With plentiful inventory and record breaking housing affordability conditions, REALTORS® expect this year’s spring home buying season to be a busy one. To kick off the season, REALTORS® from coast to coast will host thousands of open houses as part of the REALTOR® Nationwide Open House Weekend. On April 28 and 29 REALTORS® in the Greater Rochester and Finger Lakes region will hold open houses all weekend long, bringing buyers and sellers together. REALTORS® will be available at open houses to answer consumer questions about the home buying process and local market conditions. While the housing market continues to recover, it’s showing signs of improvement, and for many, homeownership remains an important part of the American Dream. According to research from the National Association of REALTORS®, more renters than ever aspire to become homeowners and an overwhelming majority of Americans believe buying a home is a solid financial decision. Earlier this year NAR reported housing affordability conditions reached the highest level since recordkeeping began in 1970. The housing affordability index is based on the relationship between the median home price, median family income and the average mortgage interest rate. The index reached 206.1 in January, the first time the index broke the two hundred mark. The higher the index, the greater the household purchasing power. This means the typical family has roughly double the income needed to purchase a median‐priced home. GRAR is informing Sellers to prepare to hold their home “open” for at least one date this weekend and begin to prepare your property inside and out (remove clutter, clean, wash your windows, tend the landscaping, etc.). As Alex reported 4/21/2012 on Property Source Radio. Mortgage foreclosure scams — which seek to dupe struggling home owners with offers to save them from financial troubles — have soared nearly 60 percent this year. Scammers are increasingly using federal programs, like refinance programs such as HARP and HAMP, to try to trick home owners, reports the Homeownership Preservation Foundation (HPF), a nonprofit group that helps home owners avoid foreclosure. About half of the reported scams to HPF tend to involve claims of specialized “legal services” from attorneys or individuals to help home owners avoid foreclosure. The HPF warns that scammers also are using the HPF logo and brand to try to dupe home owners in foreclosure rescue scams. “The only way distressed home owners can be certain they are dealing with a trained HPF counselor is by calling 888-995-HOPE,” Hernandez says. After a 4 month absence, Lana Torre returns to Property Source Radio!! Tune is this Saturday morning from 9-10am on Sportsradio 950AM ESPN as she talks with House & Coyne. Lana brings a special guest with her, Stacey Haralambides who is the owner of the Aristo Development. Builders of Fine homes and subdivisions such as Woodcliffe, Coastal View in Webster, Canal Grove, Cobblestone Creek and Mallards Landing. Stacey and Lana talk about the current new homes market both nationally and locally in Rochester, NY along with building Trends for Baby boomers down-sizing to smaller and more manageable spaces. Carlos Rodriguez closes the show with a couple more scams to watch out for. Join Steve Hausmann and Pat Coyne each and every Saturday from 9-10am for Property Source Radio. You can listen on the radio or stream the show from your computer or smart phone.